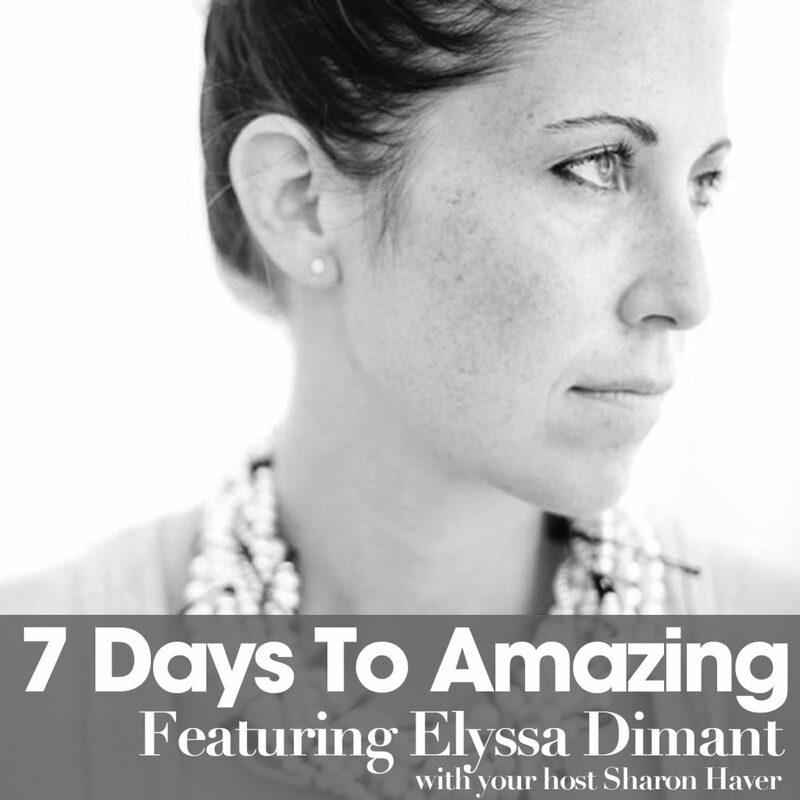 So many of you have asked me about finding style inspiration that I decided to switch around the format for this week’s episode of The 7 Days to Amazing Podcast. We will be back to having inspiring guests to make your life, style and business more amazing during the next week, but for now, let me take the mic and help you find your style inspiration by way of discovering your personal muse to guide you on your journey. Don’t miss my new & special complimentary guide to get you there! Get The 4 Pillars of Style Guide ! Need some style inspiration? No problem. I created this guide to help you discover your style muse. 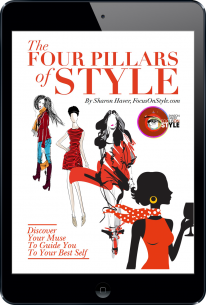 You can access a free copy of The 4 Pillars of Style eCourse by visiting www.FocusOnStyle.com/4pillars. When you sign up, you also get a free live training session with me! Discover your Style Muse today! 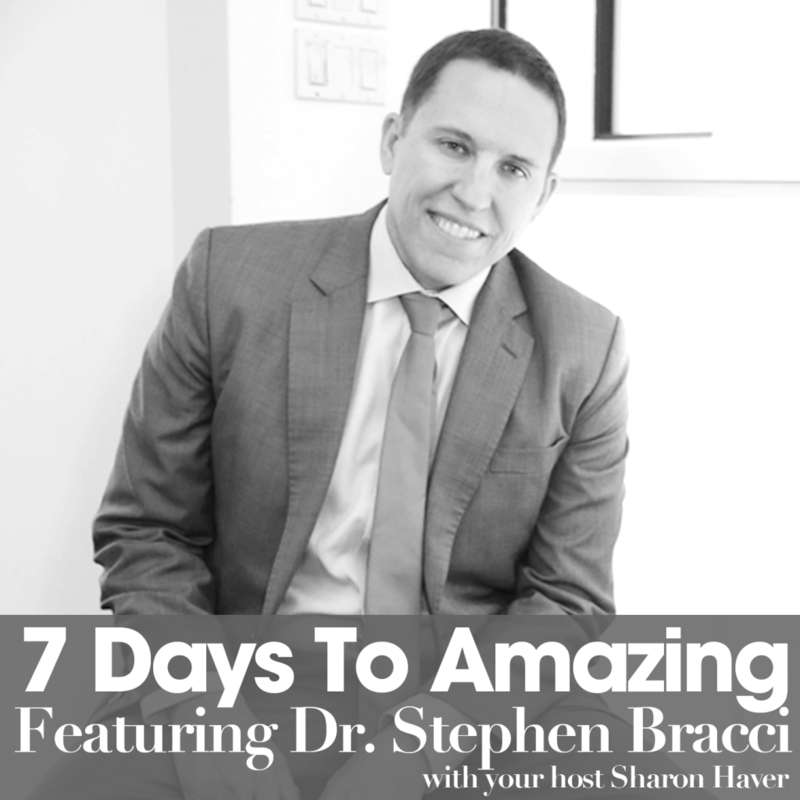 Sharon Haver: Hello everybody, this is Sharon Haver on this week’s episode of 7 Days to Amazing! I want to take this opportunity to do something a little bit different this week, but I promise you that you will be amazed. We are at our apex of coming around to having you have a well-balanced background of different ways of having a full and well-rounded life, business & style. But until we get to that, let’s think about some of the guests we’ve had and if you haven’t had a chance to listen to the episodes, I would love you to catch up because each and every one of them brings something to your life to make it more special, more amazing. Style is not one sided, it’s not flat, it’s not cookie cutter – it’s everything. I’ve brought you several different guests, so far we’ve had about six awesome guests and we’ve got a few more coming up that I want to tell you about. But let’s start with episode 1 for a quick refresher of where we are before we go forward with what I want to tell you about today, which is something super new, super exciting and totally free for you. Our first guest on 7 Days to Amazing was Carson Kressley, and a lot of you know Carson from t.v and he is the fairygodstylist who started out on the Queer Eye TV show, he is also on Celebrity Apprentice, he’s got a great new book we were talking about, but more importantly, Carson was telling us ways in which you could get in touch with your style, to amp your look. And this was coming from America’s leading TV makeover expert. Which was really cool, really great. And it was a fun interview that I certainly hope you take the opportunity to back track and listen to it again, or for the first time if you haven’t. For episode 2, we had Jackie Ruka, Jackie is America’s ‘Happyologist’ and what Jackie does is help you find the inner workings on how you interpret happiness. In other words, when you are having one of those bummed out days, and we all have our Debbie Downer days, our bummed out days – well, you want to be able to sit back and think ‘okay, let me get past this so I can excel, so I can go to the next level that makes me feel great’ and Jackie explains in both a very interesting and personable way as well as in a psychological way on how you can get happy, and be happy in what you do. Because if you’re not happy and enjoying your life, what is the point? For episode 3, we had Dr. Stephen Bracci who is an advanced beauty specialist and what he did was talk about ways to look younger and ways to look refreshed and revived in the skin you are in today. From simple little ways from getting more sleep, to water, to exercise, to fitness to injectables, to whatever it is to keep the structure of your face looking refreshed and happy, so you don’t have to look in the mirror and think ‘wow, I feel great but why do I look so awful?’ Ways for you to keep your outside in tune with how you feel on the inside and it has nothing to do with old-school facelifts or any of that stuff. This is a very modern approach to looking refreshed in the skin you are in. For episode 4, we had Kathryn Weber, the creator of the Red Lotus Letter which is the largest e-zine on Feng Shui. Kathryn was talking about ways to use Feng Shui for a better, more successful life including cool things like the color of your wallet, the color of your bag, what you wear for ways to bring more balance into your life so that you can in turn have more success, and not shut yourself off and create this Feng Shui stop gate that block prosperity from coming to you. Talking about prosperity, episode 5 had LoriAnne Reeves, and LoriAnne is a money expert and she was talking about your money story – which I find so fascinating! It’s been proven that the relationship we have with money as to how we relate to money, from our own personal finances where we can prosper comes from stories of how we were brought up, we were raised, past family history and relationships. It all affects how we see money and sometimes these things are so subtle and when you are able to touch upon it and have that ‘aha’ moment, there’s this big opening that comes from awareness and why you’re holding yourself back and why you’re stepping on your own foot when it comes to your own personal success. Sure, everyone would like more money, but this comes from your own personal house and growth. Not necessarily from dollar bills but a good part of it. That was a fascinating interview with expert LoriAnne Reeves. And then last week we took you inside some of the most iconic, amazing houses of French Fashion. That was with Elyssa Dimant, the author of The New French Couture: Icons of Paris Fashion and we learned so many different ways how French fashion houses have changed through the years, how they have created the path for trends we wear everyday although maybe not couture as most of listening here, probably all of us, can’t really afford couture. You know, it’s the fantasy of the art pieces of fashion. But what is shown on runways, the way each designer as the house lives on, you know who succeeds the previous one, creates a catalyst for how fashion transcends down to what we wear – even trends you see in big box stores and cheaper stores. It was a really fascinating interview. 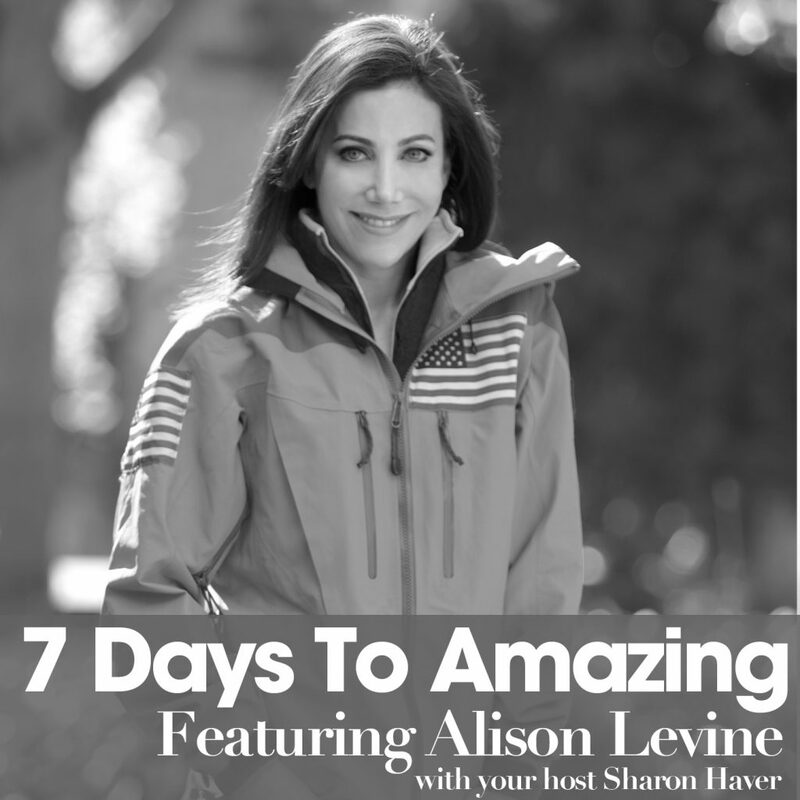 Alison Levine has climbed the 7 summits, meaning the highest peak on each continent. A few of them a couple of times and she has also crossed the North Pole to the South Pole and has been the leader of the women’s climbing team, the American climbing team. She is quite adventurous, she is amazing and she is incredible, she makes all of these athletic feats seem like nothing. And she’s funny too and wears great clothes, so I thought she would be a great guest and she was as she is coming up soon. Alison will teach you not only how to lead in your life and take charge and be able to do the best with what is in front of you today because you can’t prepare for what you don’t know. Just like if you are on a mountain, you don’t know what the weather will bring that day, you don’t know what the conditions will bring that day, but you’ll know how to be ready. And she is also a well known keynote speaker and travels to around 17 cities a month delivering speeches and she’ll also talk about speaker style, and what to wear when you travel a lot on business, what to wear on stage when you only have a carry-on because you can’t possibly check a bag you want to make sure you don’t lose is because you can’t catch up with your luggage. So that’s coming up with Alison Levine and then just to give you a head’s up before we move on to today’s topic. We’ll then have Richard Nahem who is the founder of Eye Prefer Paris and the founder of Eye Prefer Paris tours. He is a New York expat living in Paris for about 17-18 years. He is also one of my dearest, oldest friends and he is going to teach you how to find your own personal Paris or Europe wherever you are. It’s really fun and I know so many people are like ‘I wish I could this, or I wish I could do that, I want to travel there,’ but sometimes, you can’t or you can’t as much as you like. Or it’s something you need to save up for or wait for, it’s not feasible. So Richard will help you find your own perfect city wherever you are. I want them to be strategic moves that you can focus on in your life for the the week and find movement in what you do so that you can help yourself excel. So that you can elevate your personal best self in all areas of your life so that you can be even more amazing in all areas of your life than you already are. What you can do is go over to iTunes and find even more 7 Days to Amazing there, and I’d really appreciate if you don’t mind is that when you go to iTunes, because it is a new podcast, please go there and give us some love. Ratings whether it’s five stars, four stars, please go ahead and subscribe and download them. You’ll have them on your phone to listen to them wherever you are. You can also find the entire library on the FocusOnStyle site. So let me tell you what we are going to talk about today as I’ve gotten into this little habit after my friend gave me this collection of high-end French mustard, and I love French mustard, and I have this thing where I want to cut out the middleman so instead of putting it on some kind of sandwich and having the carbs, I’ll just put a cucumber in it. So it’s got low calories and tastes really good and the one I just had was a tarragon dijon, but man, that can make you really thirsty… So don’t try that at home unless you have a glass of water by you. What I have for you today is something that I think you will really love, it’s super special! I created it based on my three decades in style, and even before that because what I learned from my mom, you know most people think that because I was a stylist for over 15 years on New York photoshoots, I have spent over 15 years between FocusOnStyle.com and my syndicated column that was in over 400 papers giving fashion advice, and being a media expert and a style expert, I actually learned everything about style on the floor of Loehmann’s. Which, if you guys don’t know about Loehmann’s, it was a designer discount store. Back in the day my mother (we didn’t come from a ton of money) wanted us to look the best we can, to look like we were worth it on the limited means we had and for her that meant shopping these great designer discount stores. And in those days it wasn’t like it is now where you can get great discount designer clothes online, or in other stores. Back then it was that the designer was almost ashamed, and back then it was way before sample sales, and they would cut out the labels so that way you didn’t know who it was designed by, and you’d have to recognize the few threads around the label and it was deeply discounted. But what was cool about it was that you learned about seaming and you learned about design and shape and it was because everything was egalitarian and everything was the same. The label was missing but it was the actual garment that stood out, and I learned a lot about shape and garment construction from that. I also learned a lot about how to dress my body to feel good in my skin and my mom taught me everything. And I would think, why can’t you look like that? And they would say ‘well, I am not a model, I am not an actress and I could never look like that.’ And it made me realize that most women have this fear and a stop gate where they feel like they can’t do something because they never learned it. They were never taught it. And it’s not true! 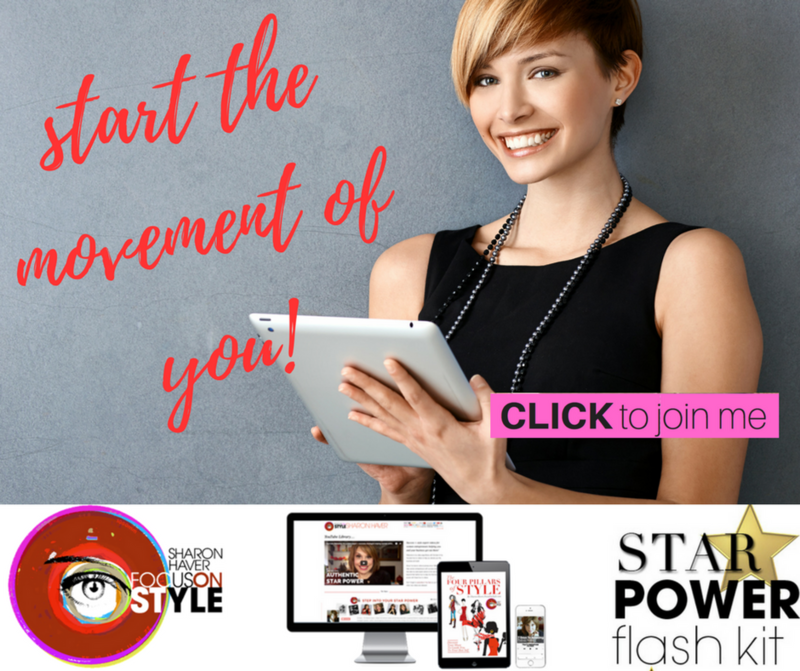 I really believe that each and every one of us has our own best stylist within ourselves and that is what I teach my students in my C’est Chic Crash Course and the course is my premiere style mentoring program and it’s taking away everything that holds you back by letting you see for yourself how you can be in charge of your look so you can show up like a success. So you can show up feeling confident and take away the velvet ropes, pull back the curtain on the me’s and the them’s, the I can’s and I cant’s so I can teach women in a way that my mom taught me which seems natural to me. That said, I’ve been around this rodeo a few times, this is not new to me! But, I was trying to figure out a way to simply break it down so that every woman, any woman, can come in and understand style. It’s a black & white issue and what it means is that it looks good, that it looks beautiful, that it looks interesting, it looks gorgeous, the wearer doesn’t look like the clothes are wearing her, she’s not buried in it, she’s not hiding in what she is wearing, she is not drowned in what she is wearing – it’s just right. It’s that feeling that everything is working. For me, Chic is the Four Pillars of Style and I created an eBook for you called The Four Pillars of style which you can get if you go to FocusOnStyle.com/FourPillars and it is totally free. The Four Pillars of Style is a way for you to find your muse to guide you to your best self and I believe so many times that the forest is hidden from the trees, that we have no idea where anything is, we can’t even see what is in front of us, and it’s there, we just need to learn to open our eyes. 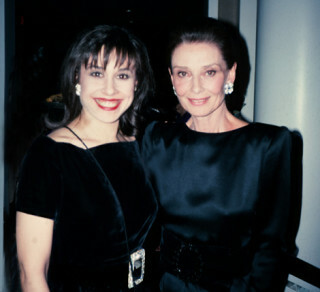 I know for me, on a personal note, it came when I met my muse and I didn’t even realize what an icon she was on how I looked at style until I was actually standing next to her and with her and spending the evening with her. And that was Audrey Hepburn. I grew up like most women of a certain age loving Audrey Hepburn movies, I would watch the reruns on t.v all the time and Breakfast at Tiffany’s and it was like a little fairy princess girl’s dream as she was so beautiful. Her cheekbones, her elegance and elan, and everything Audrey, and I can’t tell you how much subconsciously it really affected me. I had been working on a benefit committee, it was a young one, it was the New York Metropolitan Junior Committee(so that will tell you how long ago it was!) for Unicef. And I worked really hard on this committee and I was co-chairing and the woman I was doing the co-chairing with flunked out and all of a sudden I was doing the finishing touches and it was crazy. I was working 16 hours a day working on this benefit for Unicef and I really believed in the charity and the benefit and if I commit to something, I commit. I was pretty nervous! If you go to FocusOnStyle.com and search Audrey Hepburn you’ll see the photo of me and Audrey and oh my goodness Patrick McMullen(the photographer) took it of me, and I am forever indebted to Patrick for doing that because it’s really one of my most prized mementos. Audrey was everything you imagined. Every woman came up to her and was like ‘oh Audrey I am such a fan of your movies…’ And basically every time someone came up they were drooling all over her and she was so gracious and would say ‘thank you, that is so lovely’ and she would shake their hand and smile at them as if she just heard it for the first time. But it could have been fifty times that evening at least where people came up to her and the same way each time she so graciously acknowledged them. And for me, acknowledgement is so important in everything you do. One of the things that blew me away personally in a narcissistic way is that that night I didn’t know what to wear. I am meeting Audrey Hepburn – so what do I wear? I used to collect vintage clothes and old seamstress maker French Couture level dresses and I found this beautiful black velvet dress and it’s classic and I had a black velvet belt with Swarovski crystals that I think was from Oscar De La Renta and also had these big floral earrings that I got at a sample sale and I think they were from Oscar or Carolyn Roehm at the time, they were chic floral earrings. I don’t wear earrings anymore but I did then and when I met Ms. Hepburn for the evening I was so unbelieveable blown away that her earrings were almost identical! I mean it was almost impossible to think her earrings were not mine, I mean the difference was so minute. Her’s were real, mine were paste(but good) and mine were probably a copy of the earrings she was wearing and the earrings she had on I would have guessed were probably jewels by Jar. And I cherish that photo because here I am subconsciously dressing like my muse. I came in wearing something very similar to what she on, the black and the elegance. But the earrings and everything about her, I just saw that she made and inspired my style. Going back to The Four Pillars of Style book, I realized that for a lot of women, they need muse. They need some inspiration, they need someone to guide them. I created four muses for you based on the Four Pillars of Style which for me is the word Chic. The first muse stands for confident because the first part of being chic is confidence and that is represented by Chloe Confident. And my muse Chloe knows that no matter what, confidence is key to not only knowing how you project yourself but how you have your own inner joy. Confident means that whatever you are wearing, you know it is right. You know that’s what makes your heart sing, that’s what makes you feel good cause you look good and you know it. For that muse I like to call her Chloe Confident in the Four Pillars and I could go much further into it but that’ll give you a quickie right now as I want to keep us at our regular time here. Then the next pillar of style is being harmonious. Remember Chic, very clever, C-H, and that’s for Heather Harmonious. And for Heather, she knows that she needs to have everything about her come together in the most harmonious way without any confusion that distracts from her presence. That’s a way of having that ease, that elegance and simplicity, of knowing that everything on you goes together as a whole. That one thing is not so abstract that it takes away from another. That one thing doesn’t drown you because it is dated or old. There simply are shapes that don’t flatter or go together or complement each other. Everything is harmonious in one being. For the third pillar in Chic, we have interesting. For that one my muse is Isabella Interesting and Isabella knows that to truly have that certain something your entire life, it needs to come together as a whole to be interesting, amazing. So that you can be the best version of yourself so that you can excel in all that you do. Interesting is a way to have that personal, unique touch so that whatever you are doing, it’s you. It’s not the cookie cutter of somebody else so you don’t look like the exact copy of your muse or your icon or whom or whatever inspires you, so you have that interesting flourish that is only you. That is special to you. And the last style pillar and the last letter in Chic is C for Classic. And my muse for that is Connstance Classic. Constance knows that you are tired of being stressed out when you get dressed and you are transitioning to a new phase in your life, one that celebrates who you are today. You understand that you are unique but don’t want to have any of those ‘what was I thinking’ moments when you are out there. Trendy is not your thing, and you certainly don’t want to look dated. You crave a timeless edge without being boring, juvenile or heaven forbid dowdy. The Four Pillars of Style are Confident, Harmonious, Interesting & Classic. For each one in the guide I have a muse just like Audrey is my muse to help you find your path to style and what’s really fun is that when you read the Four Pillars and you find which pillar is the closest to you today, you will find that that muse will guide you to even more wonderful gifts from me. She will actually gift you down to the next set of premium offers that I have so that you can pursue whatever the state you are in today and get drawn down the right path by letting your muse guide you. If that is something that resonates with you, and I mean who doesn’t need the four pillars, I mean you have got to really know this stuff. You’ve got to really feel the Confident, Harmonious, Interesting and Classic way of setting yourself forward. For that I would love for you to go to FocusOnStyle.com/TheFourPillarsOfStyle and when my announcer comes out at the end he will also take you to a link that goes there and it’s complimentary, it’s free – I am gifting this to you. It’s my new favorite toy to help you make the most of what you have got everyday. It’s the Four Pillars of Style, discover your muse to guide you to your best self, and I really hope that helps you out. I think it will. It is a beautiful eBook we had a designer put together, it’s gorgeous, it’s fully illustrated and it’s free! I hope that will help you out finding your Four Pillars of Style and I hope you enjoyed my story of meeting Audrey who was totally divine and I can’t even tell you how it was probably one of my best nights outside of meeting my husband and having my son. It was a pretty awesome evening and I feel very lucky and privileged, honored and grateful to be able to have the opportunity to meet Ms. Hepburn because she really was beautiful, elegant, graceful and poised. Sadly she passed away shortly after that night and it was a really dark day for so many women and the children she worked for at Unicef. So many women looked up to her and admired her as she really was a special character. On that note I will be bidding adieu and don’t forget the Four Pillars of Style and please go back to the 7 Days to Amazing library on FocusOnStyle and catch up on all of the wonderful guests we’ve had. 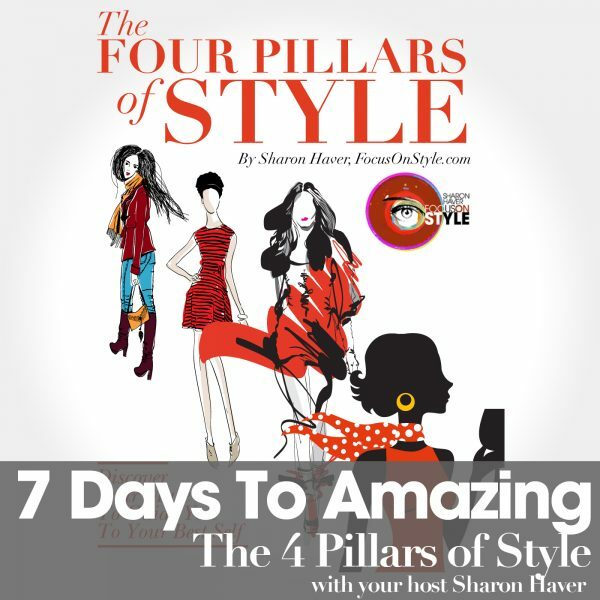 7 Days to Amazing is where every week we help you make your life more incredible and this week you are going to get The Four Pillars of Style so you can really get your chic on! Confident, Harmonious, Interesting and Classic style so you can show up and stand out like a success and feel great about yourself. I am all about having your outside match your inside so you can hone in on what you need so that you can expand your horizons, you can excel and be more amazing in the next week!